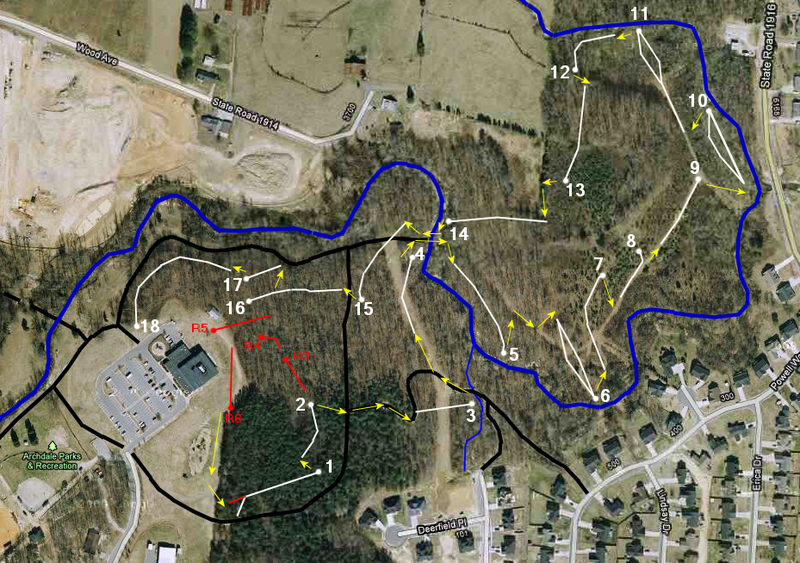 An 18 hole course that has a 6 hole beginner course also. The beginner course shares the first 2 holes of regular course. From South of Archdale: Go north on 220, take the 311 exit. The park is on the right as you get into Archdale. From the North: I-85 South. (I-85 is faster than Rte 29.) Take Exit 111 for 311 Business (S. Main St.). Turn left (south) off the exit ramp. Go 1 mile to a left into the park. Park near the Rec Center. All in all, I love this course. Design flaws include baskets too close to disc disappearing water, but that is a Russell trademark, so as to make you lose discs and buy more from his employer. Also, second pads are needed on about half the holes and sign assigned pars are arbitrary at best. This is a beautiful course. Well maintained. Easy to find your way around the first time you play. Lots of challenges for advanced and amateur players.